During the 1940s and 1950s, tens of thousands of Americans underwent some form of psychosurgery; that is, their brains were operated upon for the putative purpose of treating mental illness. From today's perspective, such medical practices appear foolhardy at best, perhaps even barbaric; most commentators thus have seen in the story of lobotomy an important warning about the kinds of hazards that society will face whenever incompetent or malicious physicians are allowed to overstep the boundaries of valid medical science. 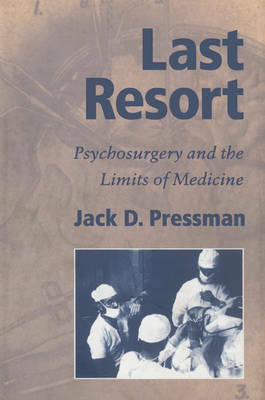 Last Resort, first published in 1998, challenges the previously accepted psychosurgery story and raises new questions about what we should consider its important lessons.